This year the Australasian Bone Marrow Transplant Recipient Registry (ABMTRR) marks 25 years and has included an extra section in its Annual Data Summary showing transplant trends from 1992 to 2016. 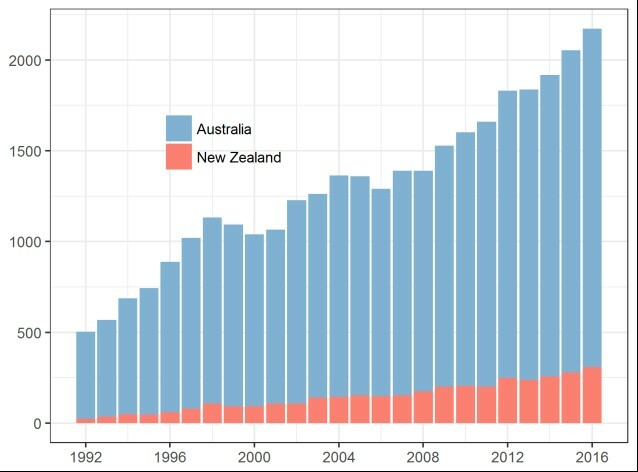 There were 2,174 registered transplants in Australia and New Zealand in 2016; and the report shows that transplant numbers continue to increase, in particular the number of autologous transplants for myeloma and allogeneic transplants for acute myeloid leukaemia. ‘Improvements in the safety of the transplant procedure have enabled older patients to be offered this treatment, with around 40% of transplant recipients in 2016 aged 60 years and over – very few of these would have been considered suitable for a transplant in the early 1990s.